Hello. My name is Joanna, and I am sewing-machine phobic. When I was a young, my mum told me she did really well at her sewing classes at school by basically having her teacher do it, and when I tried using a sewing machine in school textiles classes it felt dangerous and out of control, and I managed to get my teacher to do a lot for me too. This was all fine and dandy until I thought it would be a nice idea to make a gift for my niece, and a friend of mine suggested making her a dress, and a doll wearing a matching dress. The dress pattern is called Beautiful Red Dress by Janette Williams on The Green Dragonfly blog. The nice thing about this pattern is that the skirt is really really simple - the most basic A-line you can get, perfect for someone like me who is a complete beginner. But it's also a very flexible pattern, and would be easy to make to fit practically any size. You can see from the picture above my sewing was far from perfect, but it did the job and my niece loved it. She called it her princess dress! I followed the pattern as given for the top part of the dress too but with a smaller hook because I was making it for a smaller child. You can see details of yarn etc. on my Ravelry project page. I discovered a new love when I made this: self cover buttons. If you don't know, they're metal or plastic buttons you get in pieces, and you wrap them in fabric, then clip them together and you have a button covered with the fabric you choose. It's a perfect way to make matching buttons for anything, or for custom accessories like hair clips etc. One thing I did find though was that following the instructions on the back of the packet didn't always work - I eventually found a tutorial like this which worked much better. The doll for me was a lot easier! 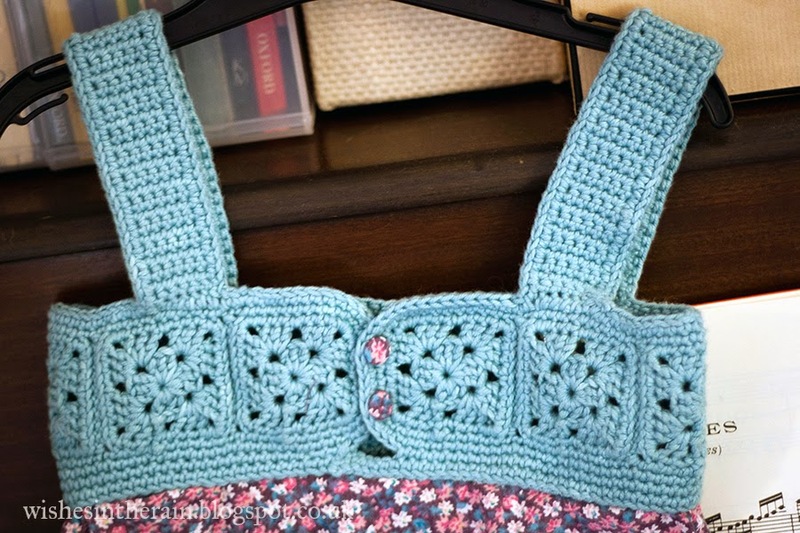 The pattern is Doll Elara by Jana Ganseforth. I named this doll Lara. 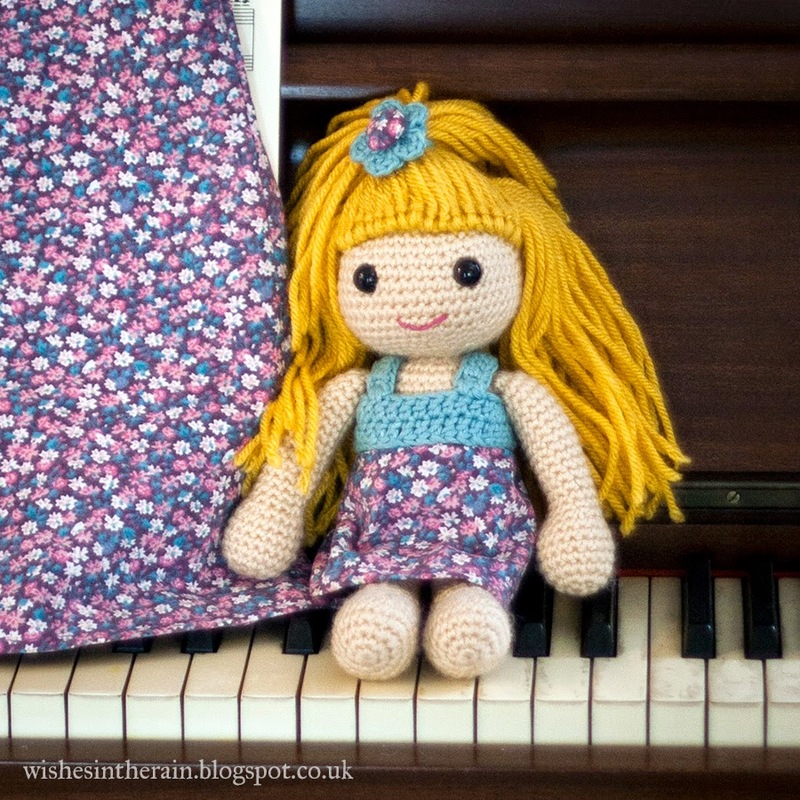 It's such a cute pattern - I spent a long time looking at different dolls and this was my favourite by a long way. 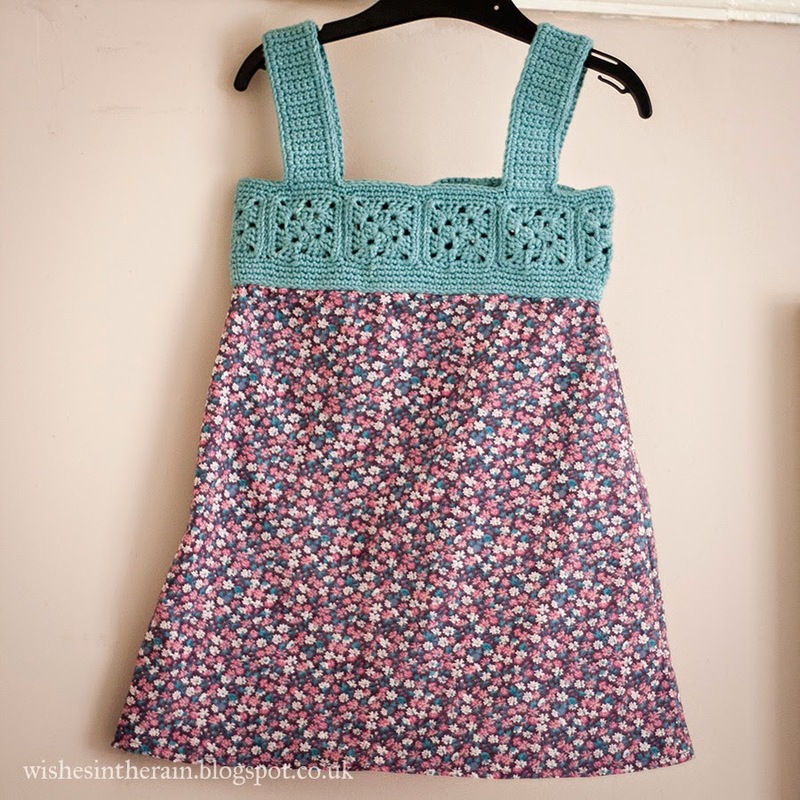 I didn't make the dress on the pattern, though; I used the same pattern as for my niece's dress. I guess that shows exactly how flexible it is! I used another cover button to make her hair ornament. I did use safety eyes for this even though it was for a two year old because I knew my niece would be supervised playing with Lara, and even if the worst happened and the eyes broke, it would be all right. But if you're concerned, don't use plastic eyes, just embroider them instead. The only thing I found hard about the doll was the hair - it took me a couple of tries to get it just right. But the tutorial is very clear, I think my problems were more from me not taking enough care. I did make a hair clip for my niece as well, but it was a bit heavy and didn't work too well in her hair. I think I'll leave it until she's six or so until I try again. Should I make one? Yes. 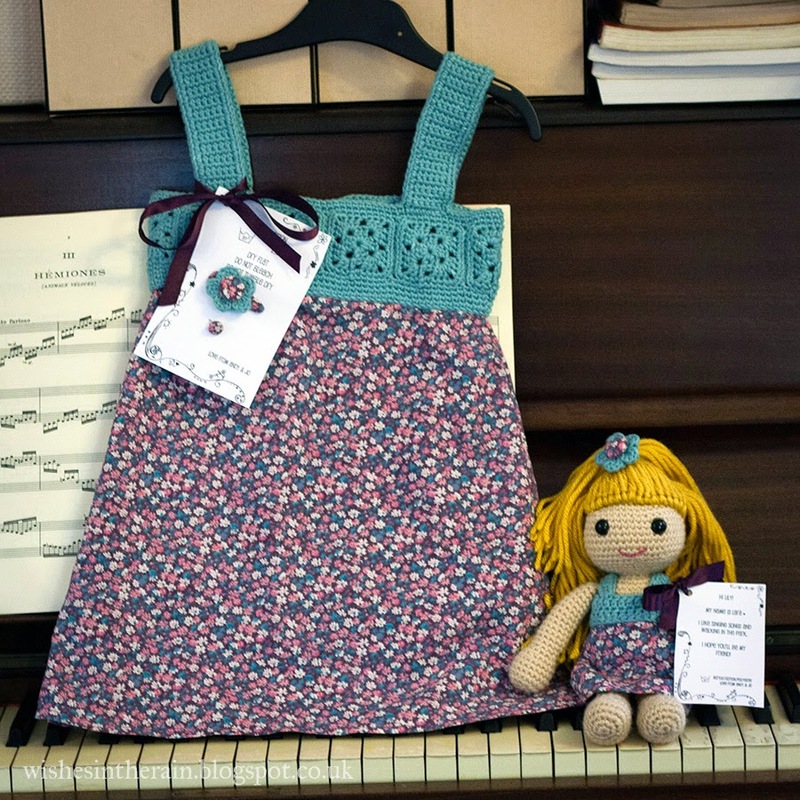 A doll and dress combo is sure to be a winner, and you can make them as girly or not as you like by your choice of fabric. You can get something worthwhile out of the dress pattern even if you are completely hopeless at sewing like I am. Definitely worth spending the time for a little girl you care about!